It is really important to prepare the site carefully. The planting site needs to be free-draining. If it is liable to water logging or impeded drainage then the drainage MUST be improved before planting. There are a number of ways of doing this and a great source of advice can be found on the RHS website. Firstly, soak the root ball/container thoroughly before planting. Prepare the site by digging it over deeply, and loosening the soil, breaking up clay soils as you go, so that air can penetrate to the roots. If the site has been compacted, then ideally prepare an area at least 6ft across, breaking up any clods of soil into smaller crumbs. 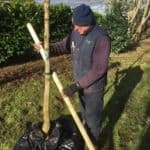 Dig out a planting pit, at least a hands-breadth wider than the root ball, and fork over the bottom of the planting pit. 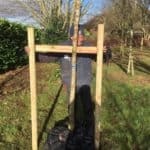 It should be deep enough so that the tree can be planted to the same depth as it was in the nursery. Place the root ball carefully in the pit. DO NOT REMOVE WIRE OR HESSIAN. 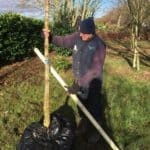 If the tree has been supplied bare rooted then remove the polythene wrapping. If a container grown tree, remove the container and place the root system carefully in the pit. Backfill the hole, firming carefully, ensuring no air pockets. The tree should be planted to the same depth as in the nursery/container. 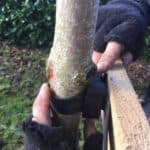 Support the tree firmly, using one or two stakes driven well in, avoiding damage to the roots. (The stakes may need to be at an angle). 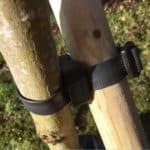 Secure with a straining bar or pliable tree ties, being careful to avoid chafing or other damage to the bark. You can purchase stakes, ties and buckles from us. 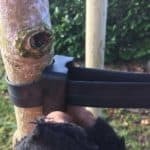 For trees up to a girth size of 16cm, a single thin stake should be used at an angle. Use ties and buckles as needed. See Images 1-5 below. 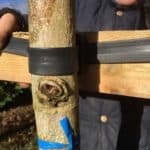 For trees with a girth size of 16cm+ a double stake pack should be used – one stake at either size of the rootball/container. 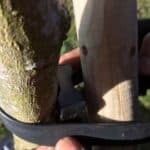 Nail a backboard between the stakes and attach the tree to it using ties and buckles. See Images 6-8 below. 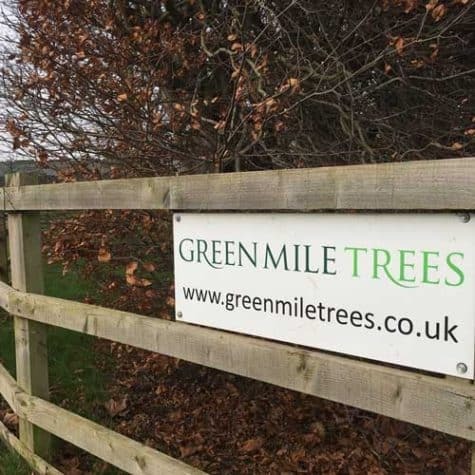 If you’re thinking you’d like to have some trees or plants planted, we can help. 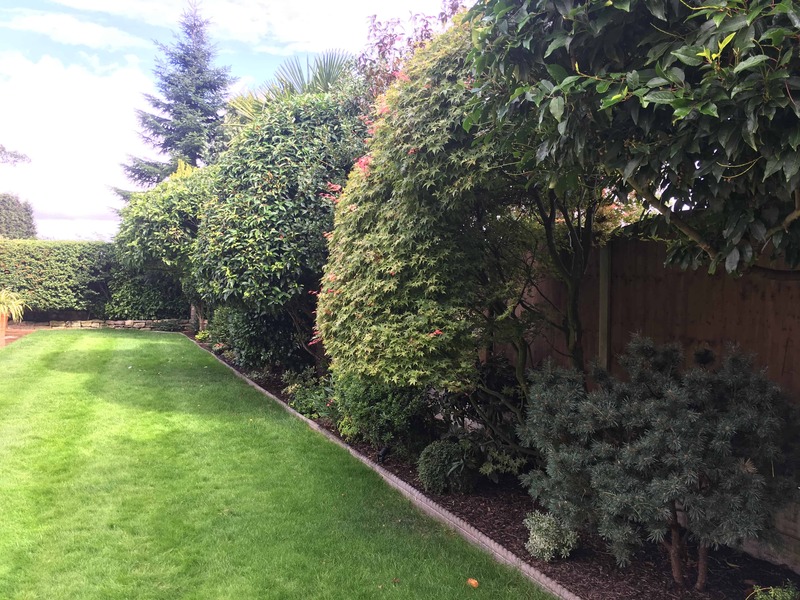 Please complete our Site Information Form and we can give you a quote for planting.